First and foremost, I cannot take credit for this one. A lovely lady, which I feel privileged enough to call a friend, shared this idea with me. She said it’s always a hit when she makes it. I wanted a new appetizer to try on Thanksgiving so I decided to try this one out. Since then, it’s been requested three more times. These little guys are incredibly yummy. But in all honesty, I don’t know why there are so damn good and addicting. I mean really, really addicting. There are just three ingredients and it’s so simply to prepare, but creates amazing results. Its one of those foods that you know will be good based on the ingredients, but you don’t realize how fantastic it will be until you actually pop one of those little babies into your mouth. Ok, I’ve gushed enough. Below is the recipe. 1- Take a slice of bacon, stretch slightly, and lay flat. 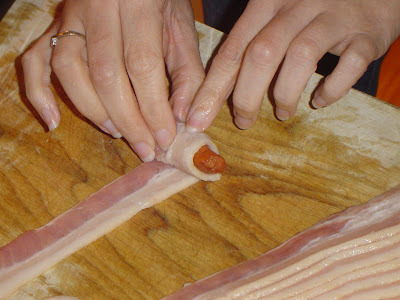 Starting at one end, wrap the bacon around each LS, until the bacon overlaps by ½ - ¾ inch. This should be approx 1/3 the slice of bacon. The goal is to get 3 LS to one slice of bacon. 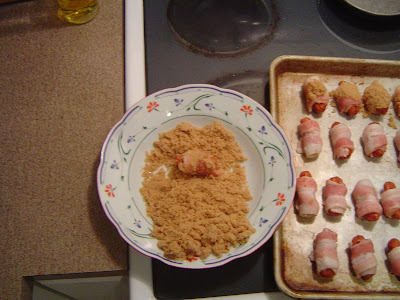 2- After you have all your LS in a lovely blanket of bacon, its time to dust them in brown sugar. I’ve tried this two ways so far, and I found the easiest way is to place the brown sugar in a shallow bowl and then dredge the smokies until lightly coated. 3- Arrange all the smokies on a baking sheet and bake at 400 degrees for 30-40 minutes or until bacon is fully cooked. Thoughts: You can throw bacon on just about anything and you can pretty much guarantee I will love it. With these you get a nice smoky flavor from the bacon, and the brown sugar creates a sweet, sticky glaze that coats each one. Pure heaven. Careful, you might get a nickname like mine....The Weenie Princess ;-) I've had worse nicknames. 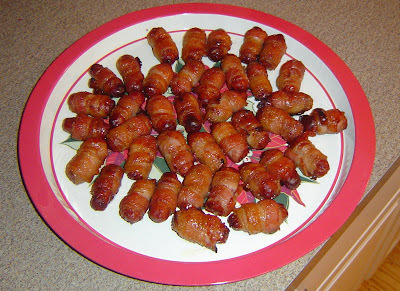 Girl, I made those smokies this year for an appetizer for Christmas Eve dinner. My mom sent me the recipe! So easy and SO TO DIE FOR!